"Are you Japanese? Do you know Michio Hoshino?" 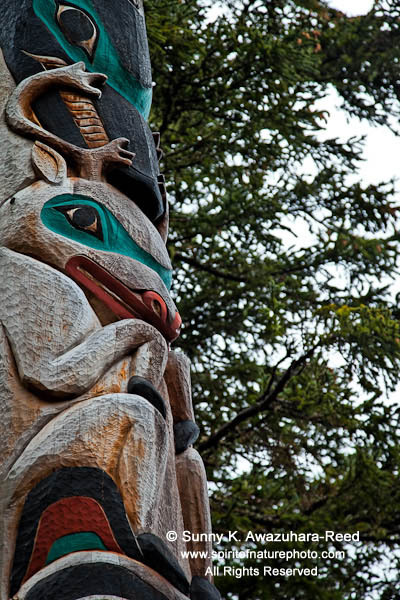 A native man came up to me at the place I was staying in Sitka. His name was Bob, he was a friend of the famous Japanese photographer Michio Hoshino. Bob has appeared in Michio's books several times. He told me that he had just come back from Japan after six months of working for Japanese indigenous rights in a small community of Japanese Natives on the North Island of Japan. He was in Tokyo when the massive earthquake hit the northern part of Japan in March. Michio and Bob shared many adventures together... Bob's eyes were looking at the past - memories of Michio. 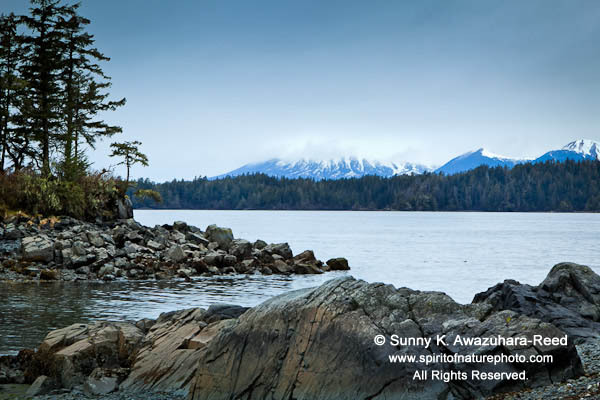 Michio Hoshino is a well known nature photographer who lived in Alaska for many years. He traveled in the remote wilderness for extensive periods of time capturing amazing images, until he was killed by a bear in Russia. Along with his photography, his beautiful writings were appeared on many magazines and books in Japan. Since I first came to Alaska about 10 years ago, I have been reading his books. As a nature photographer, I respect his works. 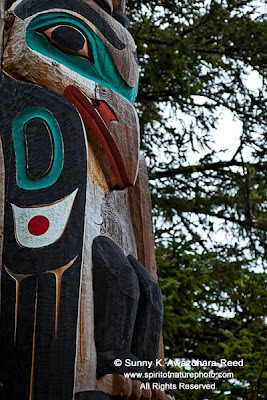 It was a heavy overcast day when I visited Michio's totem pole. Walking through old growth rainforest, the trees opened up to the shore. Following the trail along the rocky beach, I spotted the pole. 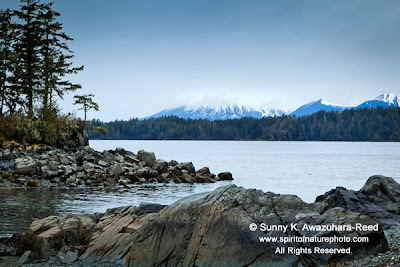 Michio's totem pole faces the Pacific Ocean, the small island floating across the shore, the snow capped Mount Edgecumbe, reminds me Mount Fuji, rises on the far island... it was a beautiful location. 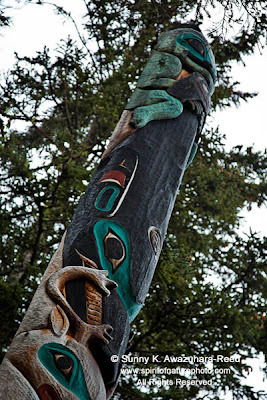 The pole is a story of Michio's life - A glacier bear (blue bear, rare kind of gray colored black bear, Michio searched for years) sits on top, followed by a Caribou and a Whale (Michio's life work of subjects), a Raven (Michio followed the Native legend of the ravens the last few years of his life), and carved Michio holding a camera on the bottom. Sitting on the shore for a while, I thought about his essays and photographs... it was a spiritual moment to me. 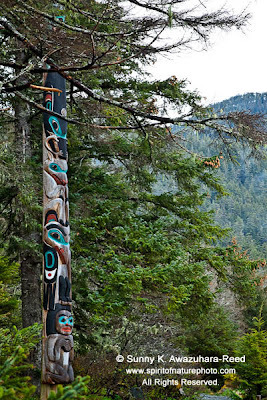 The pole was only 3 years old but it was already weathered and well matched with this old growth landscape. The sun came out for a bit that afternoon. I was photographing one of the historic buildings... when an old truck pulled over. 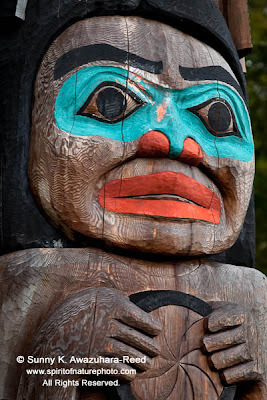 "Hey, did you go see the Michio's pole?" 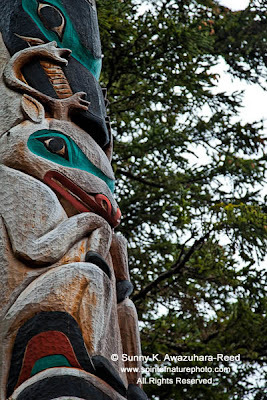 It was Tommy Joseph, the master carver, who carved Michio's pole. 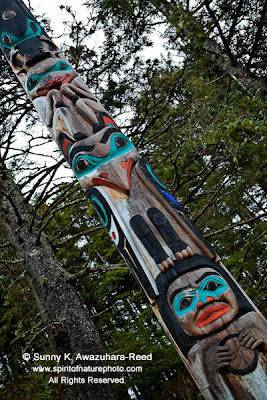 He also came and talked to me at the visitor center at Sitka Historical National Park the day before I visited Michio's pole. It was strange that Michio's friend Bob, and now the carver Tommy Joseph, seemed to somehow know that I was there to visit Michio Hoshino's totem pole.